Join Amanda and a group of intrepid quilters on an epic journey! 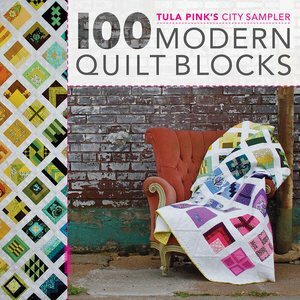 Using the book Tula Pink's City Sampler, your goal will be to make 100, 6 inch finished blocks in 100 days. The blocks are basic with no applique, and can be put together in a number of striking layouts. The book is a visual delight, and each block has a color sketch by Tula Pink as well as a photo detailing the machine quilting in each block for some great ideas. The challenge will be conducted on Instagram beginning May 7, 2017, with daily posting of photos (if you are a hard-core quilter and want to win prizes.) You don't need to post pictures, but you may just find you want to follow some of the other quilters you meet there. The ending date of the challenge is August 15, 2017. Amanda participated in the 2016 challenge and successfully completed her quilt top. She is an avid quilter and member of the Modern Quilt Guild, and is excited to coach a group from the shop. No class fees, and the only rule is that you must have your own copy of the book. We do carry this in the shop. The first meeting will be Saturday May 6, 2017, where participants will meet and decide how often they want to get together. Call the shop to let us know if you are interested.